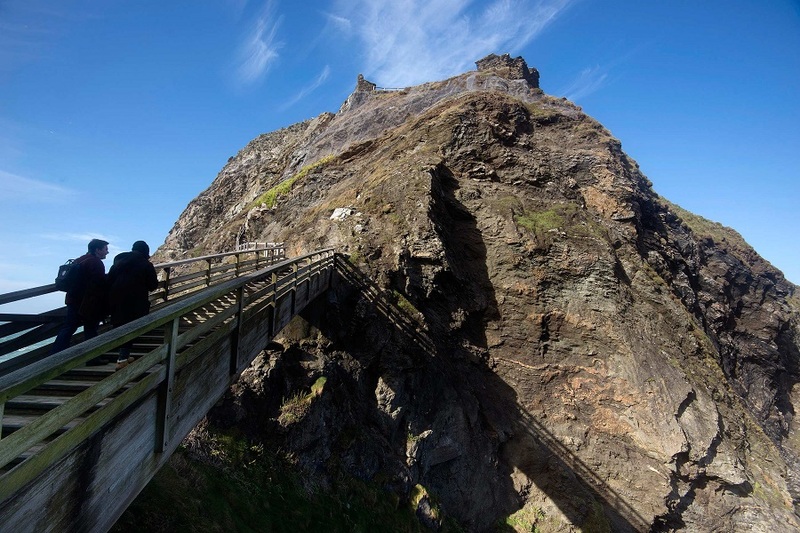 Tintagel Castle’s thirteenth-century ruins, set among sea-bitten precipices, distinguish one of the most spectacular historic sites in Britain. A place of elemental power and beauty, Tintagel is an outstanding example of a man-made monument interacting with a natural feature. Tintagel’s natural land-bridge, a slender isthmus linking the headland (also known as Island) to the mainland, has been its defining feature for 5,000 years. The Cornish name Din Tagell, means literally, the Fortress of the Narrow Entrance. This physical connection – a tenuous rocky link much-eroded over the centuries – is the source of its traditions and astonishing cultural resonance. Prized throughout history, Tintagel is thought to have been the seat of the region’s Dark-Age rulers and developed unique links with the Byzantine world during the fifth to seventh centuries. It achieved international fame in the twelfth century when Geoffrey of Monmouth’s History of the Kings of Britain described it as the place of the legendary King Arthur’s conception. 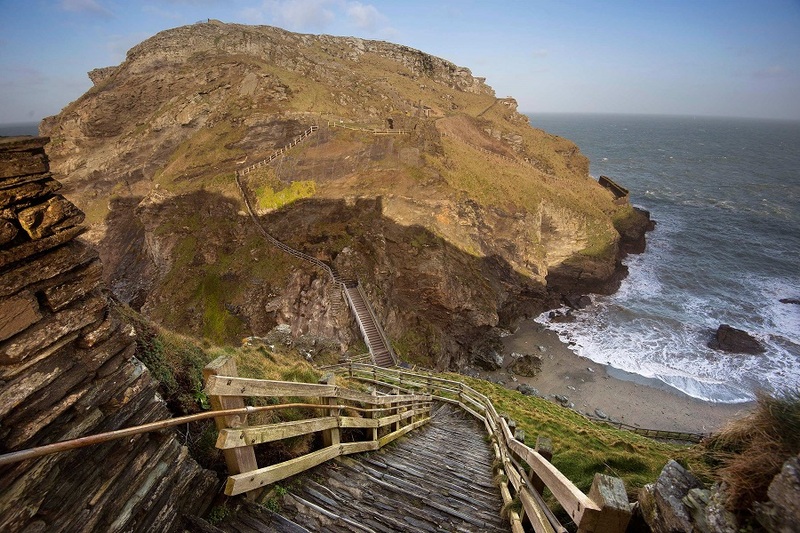 This, along with its appearance in the stories of Tristan and Yseult, may have inspired the construction of Tintagel’s romantically situated castle by King Henry III’s brother, Richard, Earl of Cornwall in the 1230s. Tintagel reoccurs in the western literary canon in the nineteenth and twentieth centuries, when both Tennyson and Hardy published work inspired by its setting. English Heritage, the guardian of this scheduled ancient monument, is now searching for a dedicated and talented architectural and engineering team to design a twenty-first century connection, a clifftop footbridge. Twenty-eight metres higher than the current crossing and 72m in span, the bridge will open up exhilarating views of the Island, coastline and Atlantic seascape as it traces the path – now lost through collapse and erosion – of the original land-link. It is expected to transform the visitor experience. The new structure, the focus of this design competition, should exemplify design at its most assured. 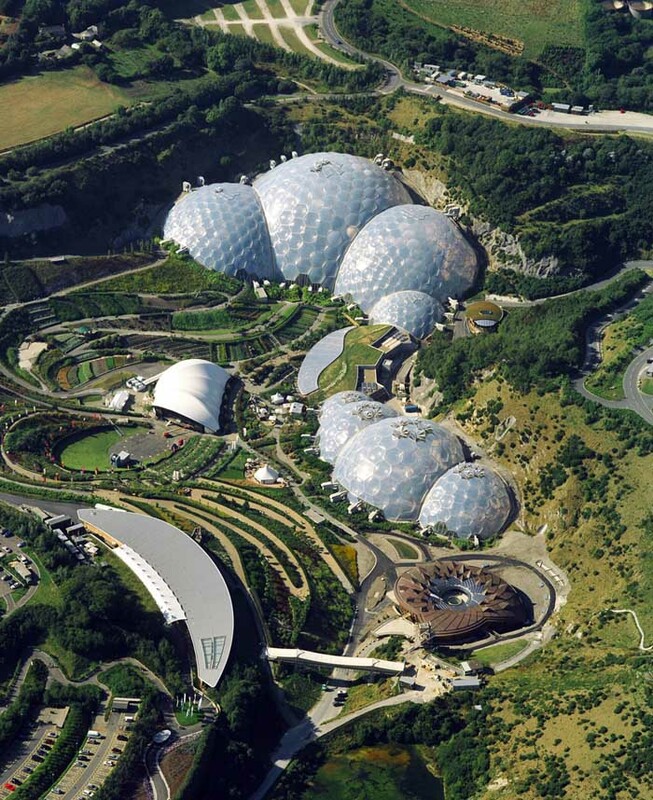 English Heritage envisages an elegant, even structurally daring, concept, which is beautiful in its own right and sensitively balanced with the landscape and exceptional surroundings – the site lying within an Area of Outstanding Natural Beauty. This is a two-stage competition; please be aware the first stage closed on July 21, 2015. Shortlisted teams will need to conceptualise a design at the second stage, which incorporates a construction methodology, in order to mitigate the challenging environment and access constraints. One of English Heritage’s top five attractions within England, the Island and castle draw circa 200,000 visitors a year, up to three thousand per day in the peak summer season. Nearly a third of current visitors come from overseas and Tintagel’s profile is growing both nationally and internationally. The existing approach, across a wooden bridge which separates the two surviving parts of the Castle, is perceived by some non-visitors as demanding and although many visitors enjoy the experience some can find it a challenge. This bridge, slung low across the chasm, suffers from congestion in the peak season, as do the linking paths which are becoming worn in places. A new bridge is needed not only to transform physical access but also to rationalise routes around the site. Aligning with the original land-bridge the new link will allow visitors to experience the historic approach and entrance to the castle’s inner bailey and enable the relatively unknown stories of the Dark-Age and medieval occupation of the site to be told. 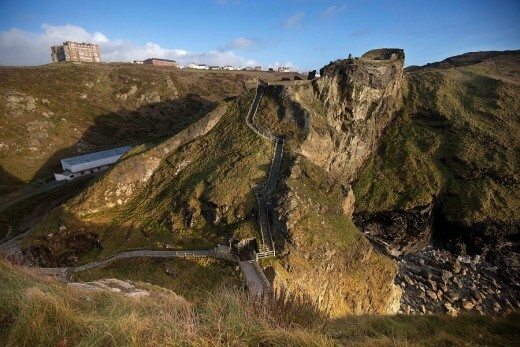 English Heritage is also launching several new interpretation initiatives for the castle and Island from summer 2015 where the history, archaeology and mythology of Tintagel are re-explored both within the visitor centre and across the wider landscape of the site so that visitors can absorb Tintagel’s fascinating history and cultural legacy. English Heritage cares for over 400 historic buildings, monuments and places – from world-famous prehistoric sites to grand medieval castles, from Roman forts on the edges of empire to a Cold War bunker. Through these, we bring the story of England to life for over 10 million people each year. This competition is being managed on behalf of English Heritage by Malcolm Reading Consultants. While coins and artefacts found on the Island indicate some Roman activity, Tintagel is historically significant for its prominence during the fifth to seventh centuries. Modern archaeologists believe Tintagel to have been the seasonal seat of Cornwall and Devon’s (Dumnonia’s) Dark-Age rulers as well as a key trading settlement, which formed a unique link with the Byzantine world. The Island has yielded evidence of ancient imported luxury in the form of olive oil, wine jars and fine tableware. Remarkably, more fifth- and sixth-century pottery from Carthage, western Anatolia and the eastern Mediterranean has been found at Tintagel than the rest of western Europe put together and to date only five to ten per cent of the site has been excavated. Tintagel’s fortunes revived again during the twelfth century when Geoffrey of Monmouth referred to the Island in his History of the Kings of Britain. Describing Tintagel as the Island fortress where King Arthur was conceived (with the aid of the wizard Merlin), his account brought Tintagel literary fame across Europe. This, along with legends concerning King Mark of Cornwall and Continental poems telling the story of Tristan and Yseult, links Tintagel back to Cornish legends, which may capture folk memories of the Island’s importance in an earlier era (though the historical record is lost). Accordingly, scholars have speculated that the construction of the castle in the thirteenth century (begun by Richard, Earl of Cornwall, younger brother of King Henry III) could have been prompted by an aristocratic desire to establish a prestigious association with Arthurian legend. Whatever Richard’s motivation, Tintagel became, and endures as, a powerful archetype of how natural features and man-made monuments can interact to form a site which has an enduring and strong hold on national consciousness and collective imagination. Although the castle had already fallen into disrepair by the 1330s, its mythical associations prompted some early tourism in the 17th century. During the 19th century, the explosion of interest in Arthurian legend and the arrival of the railways in Cornwall brought vast numbers to the site. Alfred, Lord Tennyson used Tintagel as a setting in his epic poem Idylls of the King, as did Thomas Hardy in his Famous Tragedy of the Queen of Cornwall, published in 1923. The competition site area covers the span of the bridge and the two landing areas – indicative only – on the map, right. Careful consideration will need to be given to the impact of the bridge on the integrity of the monument, the long views of the bridge along the coast and the impact of the profile of the bridge itself on views on approaching the Island. Please note: feasibility work has established a limited number of possible attachment points for the new bridge; these are indicated on the photograph below. 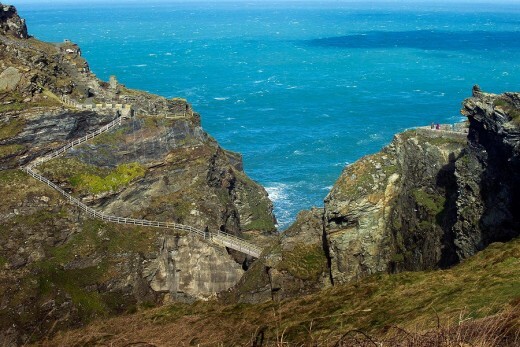 Tintagel Island, the context of the project, is situated on the Atlantic coast of Cornwall at 50.66706 degrees North and 4.75936 degrees West. It lies within the Cornwall Area of Outstanding Natural Beauty (AONB), which gives it the same protection as a National Park. While the Island is owned by the Duchy of Cornwall, English Heritage is responsible for its day-to-day management and care. The Island is closed to visitors at night and for most of the winter (excluding weekends). Public footpaths which form part of the south-west coastal path run through the mainland part of the site. 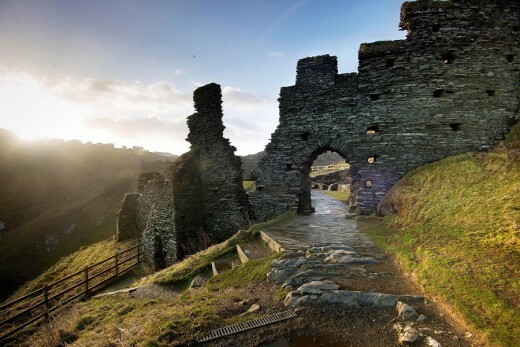 The remains of Tintagel Castle and the Island are protected as a Scheduled Ancient Monument under the terms of the Ancient Monuments and Archaeological Areas Act 1979. In addition, this lies within the Tintagel Cliffs Site of Special Scientific Interest (SSSI), designated by Natural England. Tintagel is also a Special Area of Conservation under the EU Habitats Directive. Additionally, the site also falls within an Area of Great Historic Value as designated within the Cornwall Council Structure Plan. Please note: the first stage of the competition is now closed, below is the original call to interest. In the competition we will welcome Expressions of Interest from teams, which should include both experienced architects and engineers who can deliver a challenging and sensitive project to deadline and within cost constraints. Additional skills may be proposed in the submission if necessary. English Heritage is a progressive patron and will encourage teams which balance seasoned experience with emerging talent. The team-lead must be identified, but may be either an architect or design engineer. It is hoped the proposed bridge – spanning 72m, 28m higher than the current crossing and approximately 2.4m wide – will enhance and improve the existing setting of the monument and the experience of the site. 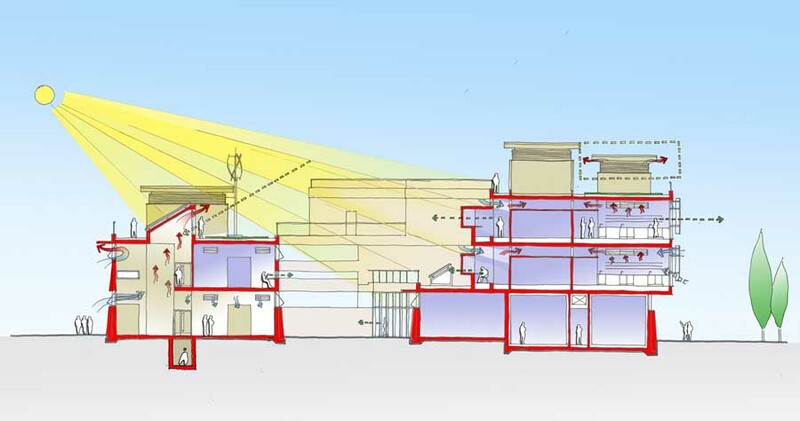 More than just a practical passage, it will offer exhilarating new viewpoints and be part of the integrated interpretative journey around the wider site and castle. While it is not expected to protect users from the weather, it should be safe to use in the normal range of climatic conditions – the site itself being closed during severe weather events. Budget and programme: Total project costs are estimated to be £4 million (including, fees, VAT and associated costs) and delivery of the bridge is expected to be by Spring 2019. This is a two-stage competition, and at the EOI stage we are not seeking a design but an explanation behind the proposed composition of your team, an approach to the issues at hand, and a reaction to the emerging brief. Graham is a founding partner of Allies and Morrison. The practice, now 300 strong and in its 30th year, has won 36 RIBA awards and been responsible for a number of buildings for Oxford and Cambridge, the restoration of the Royal Festival Hall and the masterplan for the London 2012 Olympics. He trained at Cambridge University, has lectured extensively both at home and abroad, has held a visiting professorship at Nottingham University and has been an External Examiner at Cambridge and Portsmouth Universities. Graham has served as an RIBA Council member and an advisor to the Cabinet Office and has judged a number of major competitions. He has been a member of the Arts Council Lottery Architecture Committee, a Royal Fine Art Commissioner and a CABE Design Review panellist. He has been a Commissioner of English Heritage since 2011, was member of its London Advisory Committee from 2001 to 2013 and is now a member of Historic England’s advisory committee. He contributes to several Design Review Panels including his home base of Southwark and the South Downs National Park. Peter was conservation officer of Devon County Council for over 20 years and has written widely on the West Country, including a collaboration with photographer James Ravilious,Down the Deep Lanes (2000). As an Anglican priest he has served the historic churches in the centre of Exeter for over 40 years. He worked for English Heritage from 1991 and retired as Director of Heritage Protection in 2011 having piloted the draft Heritage Protection Bill through to its publication. Peter is the author of the recently revised Cornwallvolume of Nikolaus Pevsner’s Buildings of England series (2014) and is currently working on Buckfast Abbey: History, Art and Architecture, a volume to celebrate the Abbey’s millennium in 2018. He is also currently a member of the Architectural Panel of the National Trust. Ben is Senior Design Director for the Prince’s Foundation for Building Community where he is responsible for communication, research, urban and architectural projects as well as education. Ben has led over 50 collaborative planning and design frameworks for projects ranging from a new city in Gabon to Alder Hey Children’s Hospital in Liverpool. The current portfolio of around 40 projects consists of city expansions, new towns, brownfield remediation, town centre regeneration, heritage, ecclesiastical, healthcare and ecological projects. Ben is currently overseeing the urban and architectural outputs for four new mixed-use developments in the UK, totalling around 20,000 dwellings. Ben teaches at Oxford and Trinity Saint David Universities, and has taught or lectured at Notre Dame, Yale, Cambridge and Robert Gordon Universities. Ben is a member of the Royal Institute of British Architects, the Royal Incorporation of Architects in Scotland, the Architecture Club, a Fellow of the Royal Society of Arts and board member of Coed Darcy Ltd, the Form Based Codes Institute and Stroma Consulting. Barry’s university career spans more than 40 years. After teaching at Bristol and Southampton Universities, he moved on to become Chair of European Archaeology at Oxford in 1972, retiring in 2007. During his long career in archaeology Barry has served as President of the Council for British Archaeology and of the Society of Antiquaries, governor of the Museum of London and as a member of the Ancient Monuments Board. He is a former trustee of the British Museum, and current trustee of the British Museum Trust, and the Mary Rose. He has excavated widely, published numerous books on archaeology and for several years presented the Radio 4 programme Age to Age. He served as a Commissioner of English Heritage (1986-92) soon after its inception and joined the Commission again in 2006. He chaired the English Heritage Advisory Committee and served on the Research Advisory Panel and the Remuneration and Human Resources Committee. Barry was Interim Chairman of English Heritage from September 2008 to July 2009. Anna is Curatorial Director of English Heritage, where her department is responsible for the presentation and interpretation of English Heritage’s 400 properties and for advising on their conservation. Anna’s team also manages the conservation of the half a million historic artefacts that relate to those sites, which range from prehistoric tools and medieval metalwork, to a Rembrandt self-portrait and the Duke of Wellington’s boots. Anna previously ran the English Heritage Archive. She is a specialist in the history of medieval stained glass and she also runs the Corpus Vitrearum Medii Aevi, which is a British Academy-funded research project. In addition to this, she serves as a trustee of The Stained Glass Museum. Philip is the award-winning author of a number of books of travel, history and fiction. He spent the 1990s travelling to and writing about the Middle East and the territories of the old Soviet Union, years which produced books like The Crossing Place: A Journey among the Armenians, The Bronski House andThe Spirit-Wrestlers. His more recent books – The Levelling Sea(2011) and Rising Ground (2014) – concern aspects of British landscape and place. He is a fellow of the Royal Society of Literature, a trustee of the Royal Institution of Cornwall and an honorary fellow of Falmouth University. His work has been translated into fifteen languages. Philip now lives in Cornwall on the tidal reaches of the Upper Fal with his family and a number of boats. Roger is a Fellow of the UK Institution of Structural Engineers, and leads Foster + Partners’ Structural Engineering team. He gained his degree in structural engineering from Cambridge University and began his professional career in Paris. In 1994 he joined Ove Arup and Partners, becoming a director of the firm in 2003. The Structural Engineering team within the practice has been built on the basis of technical excellence, with an emphasis on the design of complex structures. Recent projects within the group include the Chateau Margaux winery, The Maggie’s Centre for cancer care in Manchester and the new Tocumen International Airport in Panama, currently nearing completion. Roger has won several prizes for his engineering work, including the 2010 Royal Academy of Engineering Silver Medal. Tracey joined English Heritage in 1991 after a career in the tourism and leisure industry. She has progressed through a number of roles from General Manager at Dover Castle to South East Historic Properties Director before securing the national role of Historic Properties Director in 2014. She is responsible for the operational management of 400 properties, ensuring their commercial growth, capital development and delivery of commercial targets. As well as this, she is responsible for devising and delivering the Capital Investment Programme worth £18m which underpins the Charity Forward Plan. Tracey has led the successful delivery of capital projects in the South East region worth in excess of £15m, including the Great Tower and Secret Wartime Tunnels at Dover Castle, Queen Victoria’s Beach and Swiss Cottage at Osborne on the Isle of Wight, and a new Visitor Centre at Battle Abbey, a project for which she was instrumental in securing planning permission. Kim is a landscape architect and environmental planner who collaborates with architects and engineers around the world and combines designing with the muddy practicalities of running a small farm in Hampshire. Kim studied history at Oxford and landscape architecture at the University of California, Berkeley, before setting up his landscape studio in London in 1989. He continues to teach and lecture in America; writes optimistically about land and place; and meddles in various national committees on landscape and environmental policy in the UK. Kim was awarded an Honorary Fellowship of the Royal Institute of British Architects in 2002 and made a Royal Designer for Industry in 2009. He published Led by the Land in 2012. Current projects include the redesign of the grounds of the Natural History Museum in London and the Churchill memorial at Blenheim Palace. The Competition is being managed by Malcolm Reading Consultants (MRC). Malcolm, an architect by training, founded the company after six years as Director of Design and Architecture at the British Council. He has overseen international architectural competitions for leading organisations, including the V&A, the Foreign & Commonwealth Office, the Solomon R Guggenheim Foundation, Mumbai City Museum, Glasgow School of Art, and the Natural History Museum. He was on the Board of Historic Royal Palaces from 2005-2014, is a trustee of English Heritage and Edinburgh World Heritage, a fellow of the Royal Society of Arts and an honorary fellow of the Royal Geographical Society. Malcolm was president of the 2014 Prix W architectural prize, a judge of World Architecture News’ 21 for 21 Award, the AIA (American Institute of Architects), UK Excellence in Design award and World Architecture News’ Education Award 2015. He writes a monthly column for the Architects’ Journal.